This state of the art keyboard tray works well with any articulating arm mount. 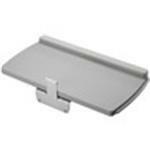 compatible with vesa 100x100mm, it mounts securely onto the vesa plate. very easy to clean and equipped with a retractable mouse pad, (for left or right hand use), this product is a great solution for mounting your keyboard.